Thanks so much for making your way to Week 4 of the Crazy Days of Summer Photo Challenge! Today as you navigate through the yellow maze, you will find a tip for every photo. I am by no means any kind of expert on the subject, but years of mistakes have taught me a thing or two. Tip #1- Take lots of photos. Digital cameras now allow you to instantly view the results and delete whatever photos you are unhappy with. Regardless of what some pros may claim, it often takes tons of photos to get that perfect shot- even when the stars are aligned perfectly. After weeding my way through a couple hundred (GASP) pics of my daughter's get-this-bug-off-me face I found some gems. Happy sigh. It was not all for naught. But the picking and choosing of the cream of the crop is a monumental task if your name is Alicia and you can't make a decision to save your life. So, bring on the yellow photo overload! Tip #2- Choose the location ahead of time. Getting the photos we want often requires a little prep work. So, I dragged my bench and my lemonade to a shady spot immersed in the woods of the Palisades-Kepler State Park because regardless of what her face may say in the other 200 photos, my daughter prefers to be outside in nature. She loves tadpoles and frogs and I was convinced that this would be a perfect location for some fabulous yellow shots. And since I'm a bit biased, I'll let you be the judge. Tip #3- Know your camera. Whether you have a stock lens or a $1400 canon (just dreaming out loud) you have to know how it works for optimal results. Read your manual, take some classes, or just shoot! Practice is the best way to learn. If you are going to shoot midday as I did here, make sure to find a shady spot. Evening light is preferable for portrait photography. I loved working with my new Tamron 28-75mm f/2.8. A fabulous addition for portrait shots. You can read more about my thoughts on auto vs manual modes for DSLRs here. Tip #4- Accessorize. 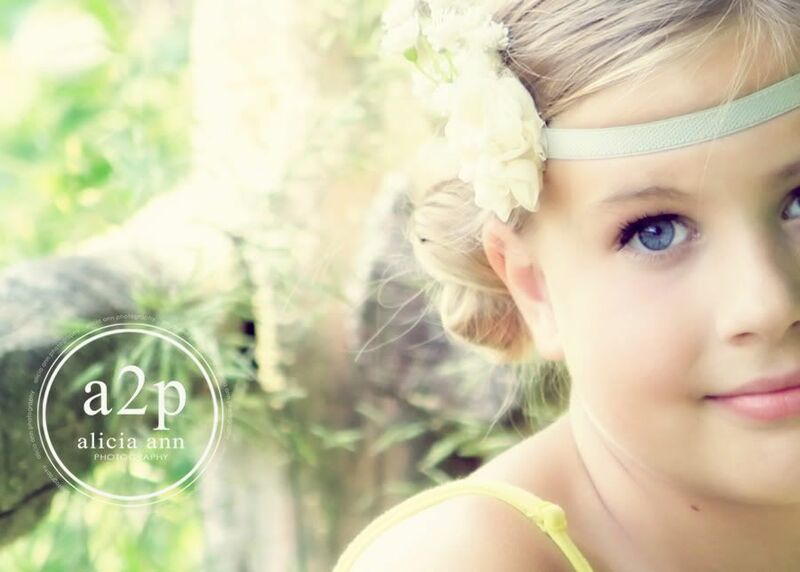 Costume jewelry and cute hair accessories are perfect for girly photo shoots. This headband was made by yours truly because I ran out of time to order something fabulous and we were left to resort to Michael's. No judging. I have my eye on some adorable headbands and clips at Poppy Row. But, I do believe the accessories can make or break a shoot. Tip #5- Use props. Don't be afraid to use props. They can put the subject at ease. 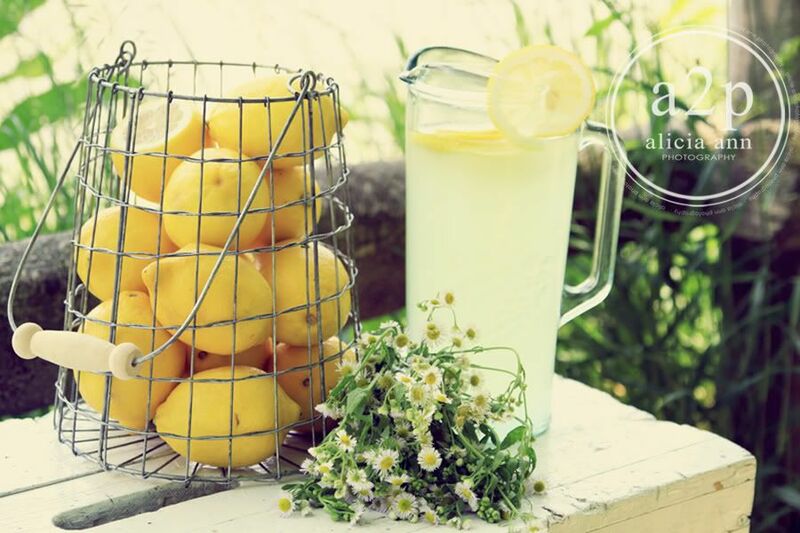 What screams summer more than a freshly squeezed glass of lemonade on a hot day? Or some sparkling lemonade from a bottle. Whatever works. Use your imagination. We brought our bench I found at an antique shop and picked some wildflowers- both perfect additions for the setting. Don't forget the scissors and bug spray! Tip #6- Know your actions. Actions can enhance a photo. For this photo I applied the CoffeeShop Perfect Portrait 3 to give it that porcelain doll finish. Love it! It was used in addition to my favorite new-to-me Florabella action- Daisy! It can be found in her Spring II Collection. Most of the photos in this series were processed with Florabella's daisy or halo actions for that soft, summery feel. If you don't have a photo editing program, you should look into photoshop elements. It is under $100 and a fabulous program that allows for pro-looking results. Or use a free program like picasa or photoscape (which is also great for collages). These freebies won't work with actions, but they have plenty of different options to spice up your photos. No need to settle. Tip #7- Keep shooting! Even when your subject looks away. Sometimes if you pay attention you will catch them in the most beautiful moment. The lighting couldn't have been more perfect. I only wish I knew what she was daydreaming about. Tip #8- Remember the details. Frame a few close-ups or crop them after for a fun effect. Photograph the details of your subject or props. It can be a nice addition to the collection. Tip #9- Count down. When your subject is exhausted and ready to quit (or is whiny as all get out), give them a number of photos left. Those last 20 photos were by far my most favorite. She relaxed and I even found a few smiles. Tip #10- Snap UNposed photos. There is a special art to staged "unposed" photos. I much prefer to capture my subject in the moment, without that cheesy smile or the stiff I-hate-taking-pictures-can-we-be-done-yet body language. This is not always an easy task. It is like the holy grail of photography. Candid looking professional shots take a little effort. Place your subject where you would like them and have them hold a prop. Talk to them and try to put them at ease. Tell a joke or a funny story if you want great smiles. Let them know if their hand or arm placement needs tweaked. Then snap away. Hopefully it will result in slightly staged, yet beautiful looking, unposed photos. Tip #11- Have fun! With all of the preparations and technical stuff it's easy to forget to have fun. My daughter reminded me of this when she picked up that lemon. It turned out to be one of my favorite shots. Just relax and go with it. Yellow is by far one of my favorite summer colors. So many beautiful shades, but I especially love these softer hues. I had so much fun with this shoot! 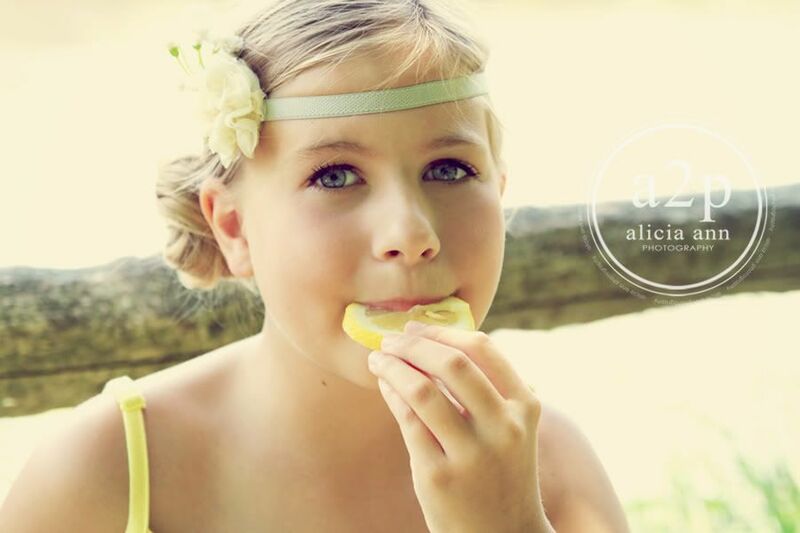 You can find the complete collection at alicia ann photography. ----------------------------------------------------------------------------------------------------------------Share your favorite images inspired by the Crazy Days of Summer theme-of-the-week and grab our sweet button while you're at it! Please link directly to your Crazy Days of Summer blog post or Flickr photo, not your blog's home page or Flickr Photostream. Feel free to share your photos in our Crazy Days of Summer Flickr Group as well. The linky will remain open from 12:00am Friday – 11:59pm Wednesday. Make a few new friends by visiting and commenting on the previous entry in the linky list. Each Thursday, a few of our favorite images from the Crazy Days of Summer Photo Challenge will be selected and featured at Project Alicia and Live and Love Out Loud. You can find more details about the meme as well as updated themes in my Summer Photo Challenge Page located in the tab to the right under my header. The theme for Week 5, July 1st is Light. Don't forget to stop over at Kristi's place to see her fabulous YELLOW shots. I am giddy with anticipation- can't wait to see what y'all came up with! these are all so beautiful shots! she is one beautiful girl!! love them all! i'm doing my entry a little different this week..i read up on your post first, I'll be shooting with your tips in mind! (hope that is okay and not cheating)see you tomorrow! Awesome shots! Your daughter is so pretty. She looks like an angel in a yellow garden. Thank you for sharing your tips about photography. SOmeday I hope I can buy my first ever DSLR. Your(hosts) photos are fun and inspiring! Oh my goodness! These are all so beautiful! Thank you for the tips--I have so much to learn! beautiful yellow shoot! I love all your shots! Wow Alicia, just wow! Amazing photos. Beautiful shots as always and Pokey is a beautiful model. Great tips, mama! I love the enhancement you added to your series. It does give a porcelain appearance. Your photos are simply stunning. Lemonade is a perfect prop too. I would have never thought of that! It just screams summer. looks like yall had an amazing photo shoot! the pictures turned out great!!!!! now, how wonderful was the lemonade? 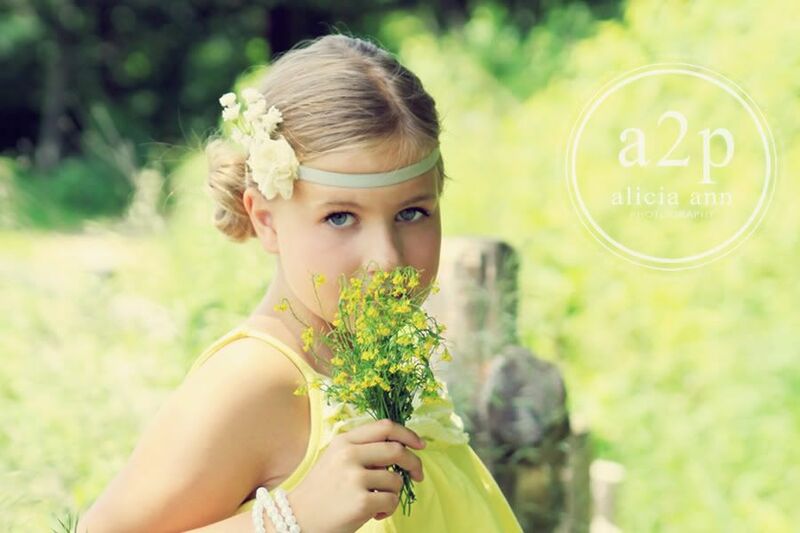 Beautiful photos of your daughter Alicia! I love all those photos! The props you used are awesome!!!! I'll try to participate in this one! Your photography is fabulous! Thank you for all the tips, someday I'm going to take a photo like that . . . Absolutely beautiful shots and a wonderful location - these are also great tips. I love those candid, unposed moments...they're my fav! I linked up with John Deere Yellow and put the blog hop on my blog also. I love and appreciate your tips. 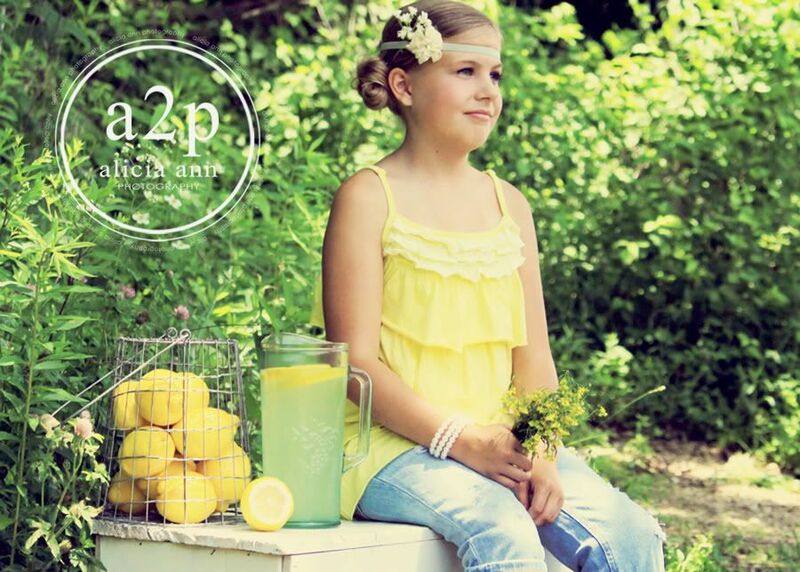 Your daughter is stunning and your shots truly capture moments...in yellow that show so much personality and style! All great shots! I love the one of her eating the lemon - I think it's the last pic. Great post too, thanks for the tips! I'm drafting a post now to enter the photo challenge! I love that your daughter is so photogenic! Such great photos! Yellow makes me happy and these pictures are no exception!! I LOVE all of them. So soft, dreamy, warm, summery! Beautiful!! These are just beautiful! I love how you also took the time to walk us all through it. Yellow rocks! these are STUNNING shots! What a great photo shoot idea! I am going to get busy and start taking more pics! Beautiful photos! Beautiful photos and beautiful young lady! Her eyes are amazing. Thanks for all of the tips! I learned a lot! Wow, these are the best photos and the tips are just fantastic. Gorgeous photos! I love the soft yellow and dreamy processing. I think the one above #6 is my favorite. She looks so soft. I love her top, and the headband is fabulous! Hi Lish, Nice blog you got here! try visit my new post: Blog SEO Tutorial: How to Choose the Best Title For Post. I hope you will learn something from it. Have a great day! Your photos are so lovely and so very inspiring!! I can't thank you enough for all your tips. They are like gold as I am delving deeper into photography! The one closeup of your daughter where you barely see her second eye? Absolutely stunning!!! Is that the same picture as before, just cropped closer? I need to rememeber that for my pictures. This is a GREAT list of tips and tricks!! Beautiful, beautiful photos. 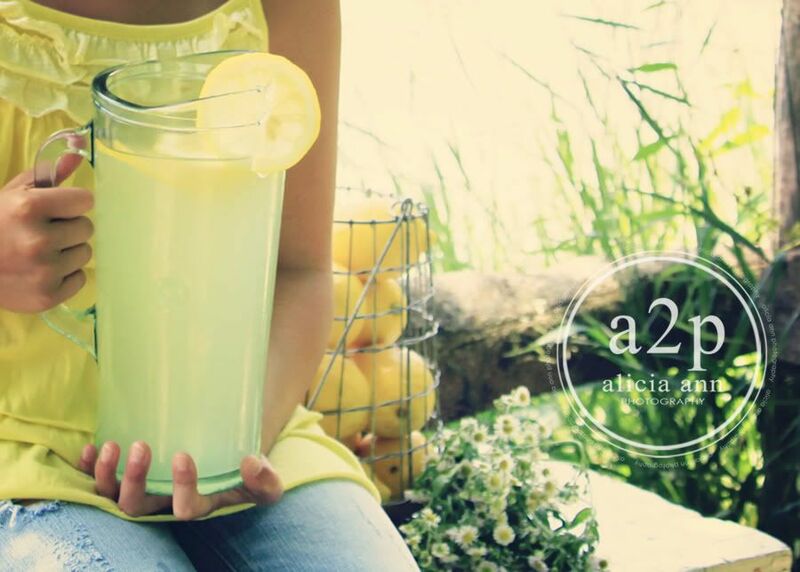 I love the lemonade theme! 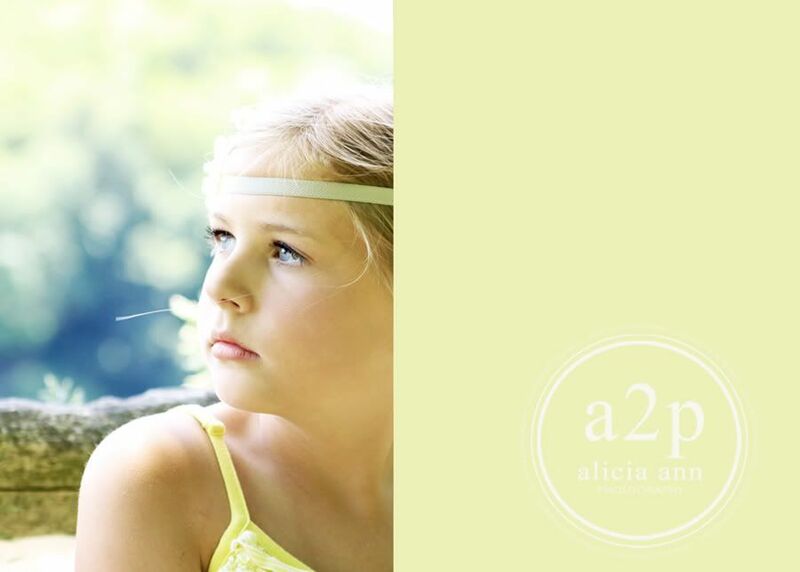 Seriously gorgeous shots Alicia! Oh I just love them- takes me to a very happy place! I love how you set up your scene and your daugther is so beautiful :) I wish my boys would cooperate even with a bribe it doesn't work. Stunning photos! You really managed to capture the Yellow! Well done! :D Thanks for all the tips as well! Oh My GOSH you are clever and Pokey is BEAUTIFUL. You know that already, right?? Wowzer, Alicia. I am just stunned constantly by your images.